Akola is a city in Vidarbha region in the state of Maharashtra in central India. It is about 290 miles (580 km) east of the state capital Mumbai and 140 miles (250 km) west of the second capital Nagpur. Akola is the administrative headquarters of Akola District located in Amravati Division. Akola city is governed by Akola Municipal Corporation. Akola District has an area of about 5,431 square kilometres and a population of 1,818,617 (2011 census). Akola is the third largest city in Vidarbha region after Nagpur and Amravati. Marathi is the most popular spoken language, though Hindi, English and Urdu are also used. Akola District is bordered on the north and east by Amravati District, on the south by Washim District, and on the west by Buldhana District. Akola District along with the rest of the Berar province was part of the legendary kingdom of Vidarbha mentioned in the Mahabharata. Barar also formed part of the Mauryan Empire during the reign of Ashoka (272 to 231 BCE). Berar later came under the rule of the Satavahana dynasty (2nd century BCE–2nd century CE), the Vakataka dynasty (3rd to 6th centuries), the Chalukya dynasty (6th to 8th centuries), the Rashtrakuta dynasty (8th to 10th centuries), the Chalukyas again (10th to 12th centuries) and finally the Yadava dynasty of Devagiri (late 12th to early 14th centuries). A period of Muslim rule began when Ala ud din Khilji, Sultan of Delhi, conquered the region in the early 14th century. The region was part of the Bahmani Sultanate, which broke away from the Delhi Sultanate in the mid-14th century. The Bahmani Sultanate broke up into smaller sultanates at the end of the 15th century, and in 1572 Berar became part of the Nizam Shahi sultanate, based at Ahmadnagar. The Nizam Shahis ceded Berar to the Mughal Empire in 1595. The Mughals ruled the Berar Province during 17th century. As Mughal rule started to unravel at the start of the 18th century, Asaf Jah I, Nizam of Hyderabad seized the southern provinces of the empire (including Berar) in 1724, forming an independent state. The rise of Maratha Empire (from 1674 to 1760) under the command of Chhatrapati Shivaji succeeded by his son Sambhaji and grandson Shahu brought the whole Berar province including Akola district under the Maratha Empire around 1734. In 1749 at the time of his death, Shahu appointed the Peshwa as the head of the Maratha Empire with certain conditions to follow. The Berar province remained under the Marathas. The Battle of Argaon, (or Adgaon near Akot) in took place on 28 November 1803 between the British under the command of Governor Arthur Wellesley and the forces of Maratha under Bhonsle of Nagpur during Second Anglo-Maratha War. In the third Anglo-Maratha War, the last Peshwa Baji Rao II, was defeated by the British. In 1853, Akola district together with the rest of Berar came under the administration of the British East India Company. Berar was divided into East and West Berar with Akola district being included in West Berar. In 1903, Berar was leased to the Nizam of Hyderabad by the British East India Company in return of the debt. The Congress's proposed linguistic provinces plan before the Independence of India had positioned Akola as the headquarters of the Berar region. After India gained its independence in 1947, the states and provinces were reorganised in 1956. Berar was divided among different states. Akola became a part of bilingual Bombay state which was further divided into two states in 1960. Akola became a part of the new Maharashtra State. The Narnala fort, Akot fort, Akola fort and Balapur Fort are some of the famous monuments in Akola. As of 2011 India census, Akola City had a population of 537,248 and an area of about 124 km2. Akola is located at latitude 20.7° North and longitude 77.07° East. It is at an altitude of 925 ft (287m) to 1036.745 ft (316m) above sea level. Akola has a tropical savanna climate (Köppen climate classification Aw) bordering humid subtropical climate (Köppen climate classification Cwa), and people predominately wear cotton clothes. Akola has a National Weather Station which serves as the local weather centre. Annual temperatures range from a high of 47.6 °C (117.68 °F) to a low of 2.2 °C (35.96 °F). Akola lies near the Tropic of Cancer and becomes very hot during the summer, especially in May. Although it can be very hot in the day, it is cooler at night. The annual rainfall averages 800 mm. Most of the rainfall occurs in the monsoon season between June and September, but some rain does fall during January and February. On the north, Akola is bordered by the Melghat Hills and forest region. The highest point in Akola District at about 950–970 m is present there in the northern Satpuda region. The Morna River flows through Akola. Purna River forms a part of the north border of the district, and the top north portion of the district lies within its watershed along with Aas River and Shahnur River. Vaan River forms a part of the northwest boundary of the district after entering from the Amravati district. Maan River drains the southwestern portion of the district. Morna River drains the mid-south portion of the district, while the southeast is drained by the Katepurna and Uma rivers. Some of the rivers in Akola and their tributaries are Purna, Uma, Katepurna, Shahnur, Morna, Man, Aas and Vaan. There are many dams in Akola district; Mahan, on Katepurna river is one of them. There were floods in 1978, 1992, and 2003. Akola district has another fact to record the lowest temperature in the month of May. Akola has recorded a minimum temperature of 11.9 °C in the month of May which is considered to be the hottest month in the state of Maharashtra. 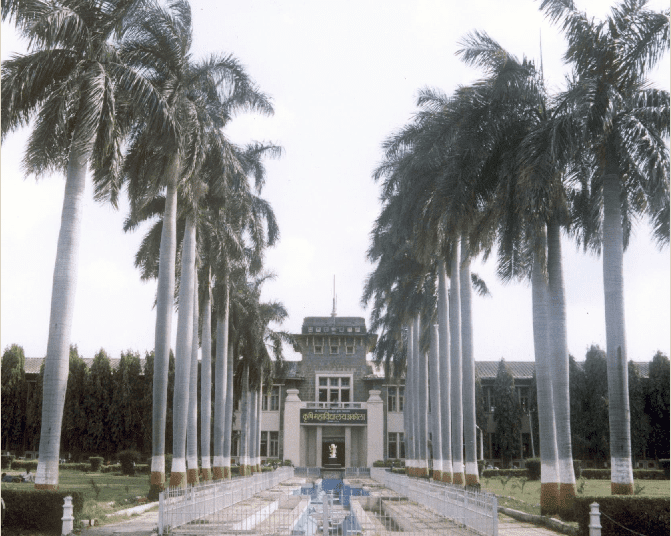 Akola is home to Dr. Panjabrao Deshmukh Krishi Vidyapeeth (PDKV), established by the government of Maharashtra on 20 October 1969. Earlier, it was part of Maharashtra Krishi Vidyapeeth since 1968. The university attracts students from far distances for its agricultural science and agricultural engineering and technology courses. All other professional colleges in Akola are affiliated with Sant Gadge Baba Amravati University. Gajanan Maharaj College of Engineering (SSGMCE) at Shegaon (in Buldhana District) is a renowned engineering college of the region, 45 km away from Akola city. NCC's 11 MAH Battalion is based in Akola, on the outskirts of the city near Jawaharlal Nehru Public Park. Most schools in Akola are affiliated to Maharashtra State Board of Secondary and Higher Secondary Education. The Municipal Corporation controls all public schools in the city. Dr. Vijay P. Bhatkar is best known as the architect of India's national initiative in supercomputing where he led the development of Param supercomputers was born in Murtijapur near Akola. When India was denied the supercomputer by US, Dr. Bhatkar took the challenge of developing an indigenous supercomputer in a record time of three years, delivered Param 8000 in 1991, and went on to develop terascale Param 10000 in 1998, propelling India into the exclusive club of select nations, who possess this strategic technology. Patrick Barr (1908-1985) was a British film and television actor, was born in Akola. Vitthal Wagh is a well known Marathi poet, writer and craft artist. He resides in Akola. He is famous for his poem "Kalya Matit Matit", which describes the condition of Indian farmer. Based on this poem, a song was composed. Kamal Narayan Seetha (born 1943), is a Vedic teacher specialising in the fields of yoga, pranayama and alternative healing. He is an authority on Rudraksha and was the first proponent of Rudraksha therapy to make the subject known widely in the Western world. He is the author of the seven time published book Power of Rudraksha. Sudharak Olwe is a Mumbai-based documentary photographer who comes from Akola was awarded the Padma Shri, one of India's highest civilian honours, for his social work. One example is his documentation of the work of Mumbai's 30,000 "conservancy workers," or sweepers. His work has been featured in national publications and exhibited in Mumbai, Delhi, Malmo (Sweden), Lisbon, Amsterdam, Los Angeles, Washington and Dhaka. He has drawn admiration and awe in the Indian subcontinent for revealing the naked reality of life's tragicomic social theatre. In 2005, he was one of the four awardees for the National Geographic's All Roads Photography program. Akola is well known for its medical facilities. It is a major centre for advanced medical treatments, such as the Elizarov technique, IVF. Akola city has the largest number of hospitals and clinics in Paschim Varhad (Western Vidarbha). Major hospitals in Akola include Civil Hospital, Sant Tukaram Cancer Hospital, Ozone Hospital, Icon Hospital, Government Multispeciality, and Cotton City Hospital. Akola city is divided into 80 electoral wards and 4 zones stretching up to an area of 124 km2. The Akola Municipal Corporation was established on 1 Oct. 2001 is headed by a Municipal Commissioner and Mayor who is assisted by the Deputy Mayor. They carry out the work through various committees such as the Standing Committee, Law Committee, Education Committee, Women and Child Welfare Committee, City Development Committee and Four Zonal Committees for the Four Zones. Vijay Agrawal is the mayor of Akola city. Akola Municipal Transport (AMT) runs Akola's public transport service. The neighbouring suburbs like Umri, Gurdhi, Khadki, Shivani (Shioni), Malkapur, Akoli, Kharab and so on are decided to be included into municipal limits. Akola Municipal Corporation launched its website on 29 December 2011. Today, Akola is a developing city and it is one of the major cities of the vidarbha region. Akola has a very good grain market, oil mills, dal (pulses) mills and is known for production of cotton. The IT sector is also growing at a fast pace. Akola, called Cotton City, is known for its cotton production and is the largest cotton-producing district in India. The city is also famous for its pulses (dal), oil, and textile mills. The city had all along been an important commercial and trading centre. The facility of goods transportation and communication system in the form of railway and roads in addition to the extension of the electric grid system and establishment of the Paras Thermal Power Station ensuring adequate electric power supply have contributed to the industrial development of the city in recent years. The Dr. Panjabrao Deshmukh Krishi Vidyapeth with its headquarters at Akola came into existence on 20 October 1969 and it added to the importance and development of the city. Agriculture is the main occupation of the people in rural parts of the region. Cotton, soyabean and jawar (sorghum) are the essential crops grown in the district. Other important crops of the region are wheat, sunflower, canola, peanut, Bajra (pearl millet), Harbara (chick peas), Toor (pigeon peas), Urad and Moong (green gram). Most crops are dependent on the monsoon. Only 15% of Maharashtra's gross cropped area is irrigated, compared with the national average of 32.9% in 1989–90. Vidarbha's Amravati division's (including Akola District) share of gross cropped area under irrigation of 9%. Considered one of Maharashtra's least developed regions, Vidarbha has seen not only farmers' suicides but also deaths caused by malnutrition. In some tribal are major reasons of recent suicide deaths of farmers in the Akola region and other surrounding parts of Vidarbha, which has rung alarm bells in the Maharashtra state government and government of India. Bharat Krishak Samaj, one of the leading organisations of farmers in India, is very active in the Akola region. It has played a crucial role in promoting the voice of the common farmers of the Vidarbha region to the attention of the Indian government under the chairmanship of Prakash Shriram Mankar. Oil and dal mills are becoming rampant in this region because of the crops taken. Textile mills are also increasing to support the cotton growing industry. The Akola MIDC Industrial Area is the largest and most economical industrial area in the division. It has three prominent industrial zones on the outskirts of the city. Cotton and jowar are the predominant crops grown in the district. Oil and dal mills are also rampant. The economy is mostly agriculture based. Nowadays, the soyabean crop is an important crop as major soyabean plants have come up in the area. The total land under Akola MIDC Industrial area is 6.25 km2. There are about 25 factories (3 large factories and 22 small factories) currently in production and another 10 small factories are in the process of being constructed. Maharashtra Government has sanctioned growth centres close to Akola MIDC area. An application of the Maharashtra Industrial Development Corporation (MIDC) for setting up an agro-processing Special Economic Zone (SEZ) in Akola district has been approved. Maharashtra State Seeds corporation (Mahabeej) has head office at Akola. There is a growing demand for setting up divisional MIDC office at Akola to cater to Akola, Washim and Buldhana districts which are away from the current divisional office and also lack good industrial growth. Well known industrial groups like the Birla Group and the Mafatlal Group have established their industries and important industries such as Berar Oil Industries, Simplex Mill, Polyophin Industry now known as NOCIL, Co-operative Spanning mill, Mohata Cotton Mill (NTC Ltd) are located in the city. Maharashtra State Electricity Distribution Company Limited (MAHAVITARAN) provides the electric supply to the city. Paras Thermal Power Station: Paras thermal power station is the oldest of all Mahagenco power plants, and is located about 20 km west of the city. The station has witnessed the third generation technology. The station had 30 MW installed capacity in 1961 with a stroke boiler. The same unit was abandoned in 1993 due to aging. Telecommunication: STD code of Akola tehsil is (0724). Newspapers: Dainik Deshonnati, one of the well-known Marathi newspapers in the Vidharbha region, originated from Akola. Other prominent newspapers published from Akola include Dainik Matrubhumi, Samrat, Divya Marathi, and City News Superfast. Entertainment: There is one four-screen multiplex, Big Cinemas, situated on Murtizapur Road. There are also many single screen theaters situated in Akola including Manek Talkies, Vasant Talkies, Uday Theater, and Regal Talkies. Akola has a good tradition of sports. A number of state level tournaments as well as national tournaments of various indoor and outdoor games are hosted here. The most played sports in Akola city include cricket, carrom, hockey, volleyball, boxing, kabaddi, chess, and badminton. Akola Cricket Club Ground (ACC) is the prominent cricket grounds in the region and is the homeground of the Akola cricket club. The ground has held two first-class matches, the first of which came in the 1983/84 Ranji Trophy when Vidarbha played the Railways, while the second saw Rajasthan as the visitors in the 1984/85 Ranji Trophy. Vasant Desai Stadium is famous in the region as it always hosts the district level tournaments of games such as running, volleyball, swimming, boxing, and kabbadi. 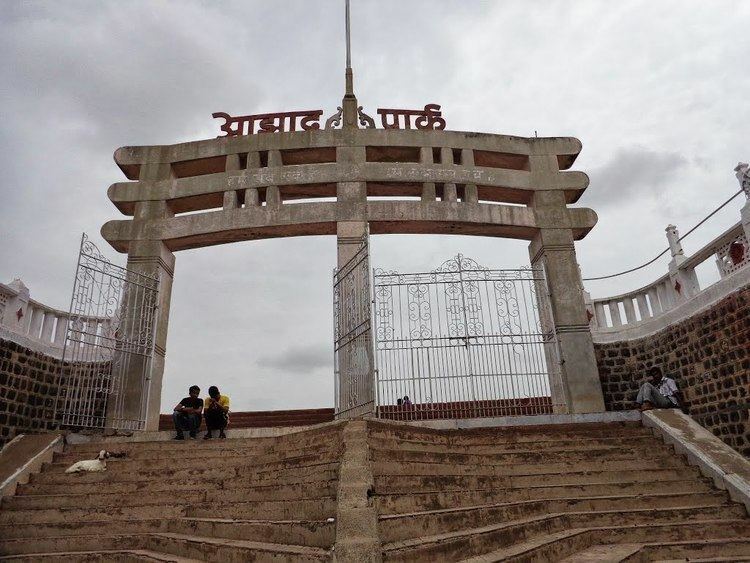 Lal Bahadur Shastri Stadium is located near Sundarabai Khandelwal Tower which is a landmark of Akola city. The stadium hosts the games like football and cricket. Akola Airport (also known as Shivani Airport) (IATA: AKD, ICAO: VAAK) is the domestic airport of Akola city and is at an elevation of 999 ft. It was built by the British authorities in the 1940s and regularly sent flights to Mumbai. Now it is non-functional, and has one runway (4,600×145 ft). The expansion and functioning of the airport has been delayed as it is unable to get land from Dr. Panjabrao Deshmukh Krishi Vidyapeeth. It is one of the oldest airports in India. The airport is just 7 km from the city on National Highway No. 6. The nearest international airport is at Nagpur (140 miles). Renovation and operation of Akola airport are taken by Airport Authority of India. The Nagpur bench of Mumbai High Court has recently given the decision to take over the required land for extension of Akola Airport from the Dr. PDKV. The work is expected to be started soon. After the extension of runway and renovation of other infrastructure, the regular flight service is supposed to be commenced. Akola has the vehicle registration code as MH-30. The NH6 runs through Akola from Hazira (Surat) to Kolkata. NH6 is a part of Asian Highway 46. The NHAI has declared to build up a new national highway from Akola to Hyderabad in Telangana State. It has been numbered as National Highway 161 (new): Akola - Nanded - Sangareddy. State Highway no. 68 and 69 also pass through the municipal limits. Other highways include State Highway 204, State Highway 200: Akola - Amravati, and State Highway 197. Akola Municipal Transport (AMT) runs Akola's public transport service. Autorickshaws are also widely used in Akola city for city transport. The municipal corporation is working with the IRDP (Integrated Rural Development Planning) to develop the roads of the city. The stopped service of AMT bus transport was restarted in December 2015 with a total of 35 buses. Maharashtra state transport buses are most commonly used by people to travel to rural parts of the region. State-owned and private air-conditioned bus services run on daily basis to most major cities to and from Akola. Bus service is available for cities like Pune, Nagpur, Bhopal, Indore, Hyderabad, Nanded, Amravati, Mumbai, Nashik, Surat and Jabalpur, as well as other important cities and towns in Maharashtra and the neighbouring states. Akola, situated on both the Howrah-Nagpur-Mumbai line and the Kacheguda-Jaipur line, is an important junction for passengers from North and South India and also for freight trains. The Kacheguda-Jaipur line is being recently converted to broad gauge and the number of trains connecting to Hyderabad has increased since then. Broadgauging of the Akola Junction-Purna railway line has recently been completed and passenger trains have started running on this route. The work ofgauge conversion (meter gauge-broad gauge) of Akola Junction - Indore Junction MG and Indore Junction MG - Ratlam railway line of SCR zone has started and is projected to be completed in a few years. Akola has good railway connectivity with direct trains to Mumbai, Delhi, Ahmedabad, Rajkot, Okha, Surat, Nanded, Jodhpur, Jaipur, Kolhapur, Pune, Kamakhya, Indore, Mhow, Ujjain, Khandwa, Ratlam, Bhopal, Chittorgarh, Nagpur, Bilaspur, Howrah, Hatia, Puri, Chennai, Hingoli, Purna, Parli, Tirupati, Ganganagar, Secundarabad, and many more important railway stations in the country. Important railway stations in Akola region with their codes are Paras, Gaigaon, Akola Junction (AK), Murtizapur Junction (MZR) and are under the Bhusawal-Badnera section of Bhusawal Division of Central Railway. The other stations under meter gauge are Hiwarkhed (HWK), Adgaon Buzurg (ABZ), Akot (AKOT), Patsul (PTZ), Ugwe (UGWE), Akola Junction, Shivani Shivpur (SVW), Barshitakli (BSQ), Lohogad (LHD), Aman Vadi (AMW), and Jaulka (JUK) under Purna - Khandwa section of South Central Railway. The stations under narrow gauge are Lakhpuri, Murtizapur Junction, Karanja under two Narrow Gauge Branch lines viz Murtizapur-Achalpur and Murtizapur-Yavatmal of Bhusawal Division of Central Railway. In 2009, a new railway station was built at Shivani-Shivar to reduce the load of goods transport of Akola Junction railway station. It is the modification of a meter gauge station into a broad gauge station. It now connects Purna to Hyderabad through Akola. Akola Junction railway station is one of the Top 100 Booking Stations in India. Now Akola urban area has two stations - Akola Junction and Shivani-Shivapur Railway Station. Marathi Sahitya Sammelan, the conference on Marathi Literature, was held twice in Akola city. They were presided over by Hari Narayan Apte in 1912 and Gopal Nilkanth Dandekar in 1981. Akola is a city with a mix of religions and cultures. There are several places of worship for Hindus, Buddhists, Muslims, Sikhs, Jains, and Christians in Akola. Shri Rani Sati Dham is a Devi (Mata) temple located near Collector office. Shree Sidhivinayak Temple Jathar peth Nr Prasad Colony is a popular temple of Lord Ganesha. Mosques in Akola city: There are a number of mosques in the town. Important amongst them are the Badi Masjid (Markaz), Masjid Mominpura and Kachchhi Masjid. Shegaon (in Buldana District), a very famous pilgrimage place of Gajanan Maharaj, is just 35 km from Akola. Gajanan Maharaj Sansthan is the biggest temple trust in the Vidarbha region and is called "Pandharpur of Vidarbha". The origin of Gajanan Maharaj is untraceable in history. People from all over Maharashtra visit Shegaon and offer their prayers to Gajanan Maharaj. (Marathi नरनाळा), also known as "Shahanur Fort", is an Indian hill fortress in Maharashtra. The name Narnala was given after the Rajput Ruler Narnal Singh or Narnal Swami. The fort was built in 10 A.D. by Gond Kings. Narnala Wildlife Sanctuary which is situated 40 km from Akola city is a principal tourist destination. Home to leopards, birds and sambars, this wildlife sanctuary also has many trees like teal, kusum and salai. Nehru Park is the well-known amusement park. A laser show and musical fountain are added attractions. 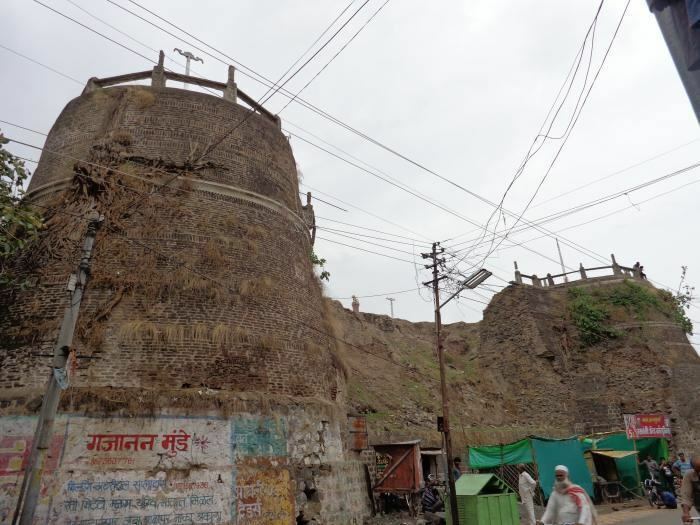 Ashok Vatika is an important religious place for Buddhist and Dalit people in Akola city. There are statues of Dr. B R Ambedkar, Siddharth Gautam Buddha and Mahatma Jyotirao Phule inside the Garden, People gather in large number to offer prayers, it is located at the centre of Akola city. 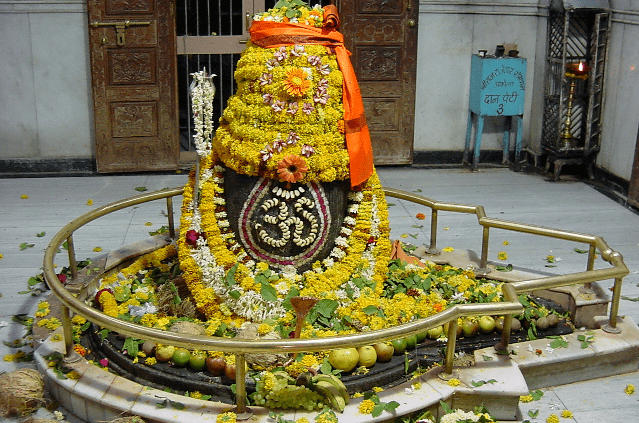 Akola's oldest Shiva temple is Rajeshwar Mandir. The city derives its nickname as "Rajeshwar Nagari" from it.